Message 656 - Posted: 24 Nov 2018, 21:00:04 UTC - in response to Message 655. It was already explained here, http://xansons4cod.com/xansons4cod/forum_thread.php?id=116&postid=639#639. There is also a warning on the main page highlighted in bold. Message 657 - Posted: 24 Nov 2018, 21:00:46 UTC - in response to Message 655. @Vlad, thank you for an interesting project, and a well run too. Message 658 - Posted: 30 Nov 2018, 16:18:53 UTC - in response to Message 655. I understand your frustration about amount of WU. But already explained by Vlad. A few months ago, I suggested him the same as you suggest. At this time, there are not very much WU from scientists, but they will again produce work. It is why, Vlad keep it on BOINC. I have made a quick estimation. With your two hosts, you can run all WU in only 2 or three days (considering 24/24 runnng). Me too ! Twice more host, but twice less powefull as yours. Now, if you want to know why all is away after a few minuts, it is easy to understand. Look only the stats and you will understand where they go ! 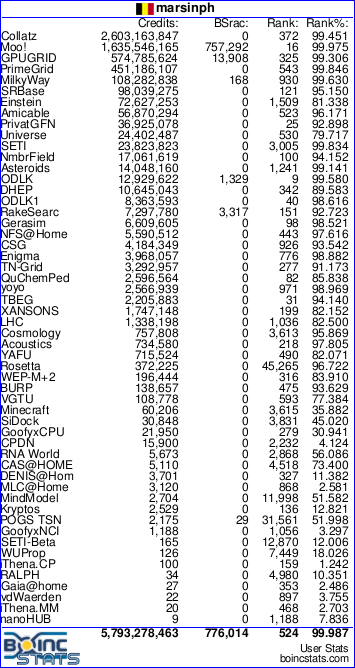 Compare with the stats and ranking on Formula Boinc, and all will be very clear ! And not forget, according BOINCSTATS.COM some users/team could this year crunch more COD than Xanson produced for the whole world !!! Vlad known about it, also Berkeley. Message 655 deleted by author's request.